My home for the next 18 hours..
After having boarded the Dana Sirena I went to look for my cabin. 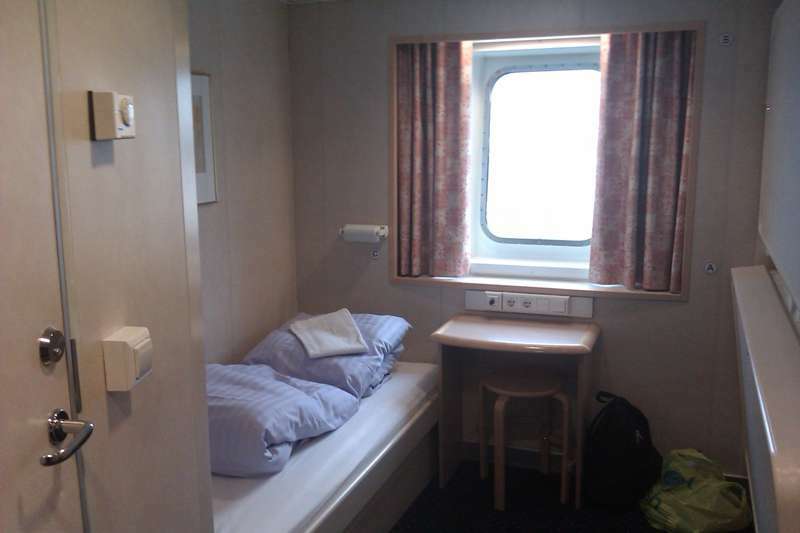 I knew from experience and tales from my mother that I shouldn’t expect much in ways of things to do on the 18 hour crossing to Denmark, so I had resigned myself to an early night in my cabin. At least the sea looked calm. I never learn, do I? Around midnight, I was rudely woken up by waves banging against the hull of the ship, doors slamming back and forth and my cabin rocking heavily. Luckily, I managed to go back to sleep and cheat the sea sickness this time. And by midmorning the sea had calmed down, and I could relax and read a few more chapters of Jenny Lawson’s awesome memoir ‘Let’s pretend this never happened’. After landing in Esbjerg in Denmark I got into my car and disembarked the ferry. Well on shore, I waited in line for passport control and customs. To my disappointment, the police just waved me through. What? Did they not want to check my passport? I could be an international spy or something. The next few hours were enjoyable. I was going at speed down the main motorway E20 across Denmark in light traffic and nice weather. Mile after mile was quickly covered, and Copenhagen and the mighty Öresund bridge was beckoning at the other side of Denmark. 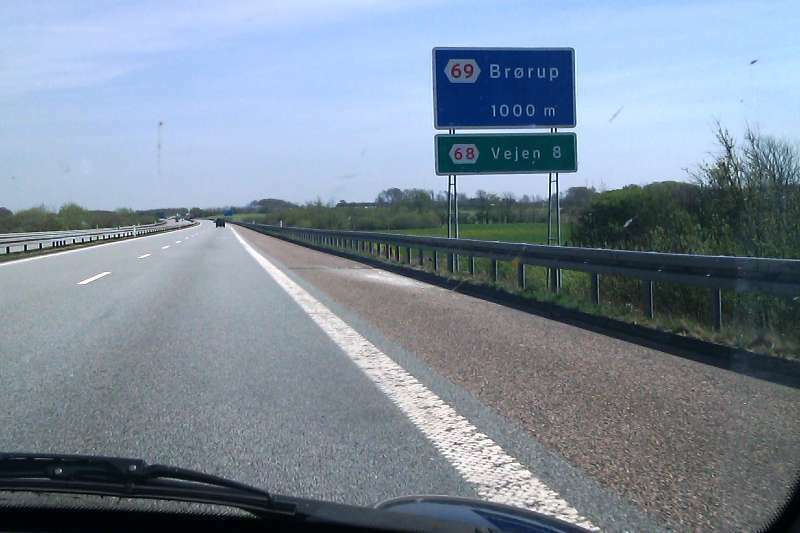 This is Denmark – flat, sunny and road signs littered with those odd ø’s. However, a casual glance at my satnav suddenly had me concerned: “Board ferry in 3 km”. What’s this? Why should I have to take a ferry to get from Esbjerg to Copenhagen? This couldn’t be correct? But, true to its words, 3 km later I stopped in front of a harbour, with what could only be described as a ferry busily loading cars ahead of me. I had no choice but to drive up to the check-in booth and pay. This is when I realised there were some drawbacks driving a right-hand drive car in right-hand traffic. The ticket booth was on the passenger side, and my passenger side window has been jammed for some time and won’t open (mental note: get the passenger side window fixed already), so I had to get out of the car and walk around to the lady in the booth. “English?” she offered before I could say a word, and I knew better than trying to correct her (any correction would lead to an extended explanation of circumstance, guaranteed to leave her suspicious and confused). So I pretended to be English, paid for the ticket and said “Excellent” and “Ta”. It wouldn’t surprise me if I would get through Denmark without speaking a single word of Danish, which made me a little sad. Coming from the Danish side, I first went through the 2,5 mile long Drodgen tunnel that exit on the artificial island Peberholm. Then I finally got onto the bridge itself. With a clear blue sky the view was amazing, and as I climbed higher and higher I could eventually see the Swedish coastline on the other side. And after having crossed the 5 mile long bridge, I entered the Kingdom of Sweden. I paid the toll and continued onto the customs booths. But, again, no one stopped me to check my passport. What’s wrong with the world? What’s the point of having a passport if no one ever checks it? Anyway, after the surprisingly long drive across Denmark, I was pretty tired and I checked in at a hotel in Lund for a good night’s sleep. And thus end part two. In part three I will travel up through Sweden and take a final ferry before finally arriving in Åland, Finland. I didn’t realize it would take 18 hours to cross! Goodness! I’m glad you had The Bloggess’s book. It’s wonderful, isn’t it? You ARE an international spy! You fooled them! In related news, I snuck liquids past TSA security in my bag today. Three bottles of nail polish. No one said a word. So you’re a spy and I could have been a terrorist and NO ONE CARES. It makes me laugh you had to pretend to be English. That’s SUCH a spy thing to do! Sorry Amy, I completely missed this comment of yours! Yes, it really does take 18 hours. And there was another ferry line from Newcastle to Gothenburg that took a full 24 hours we used once. And yes, her book is great! I’m also reading another book called Rule 34 that is really good (even though it’s written in second-person narrative, which really annoys me). Well, if your dad say I’m a spy, I must be a spy. Who am I to argue with your dad? “So I pretended to be English”. But you’re “the foreign bloke”! Still. Bloody waste of money and effort having what appears to be a valid passport and then no one is checking it! 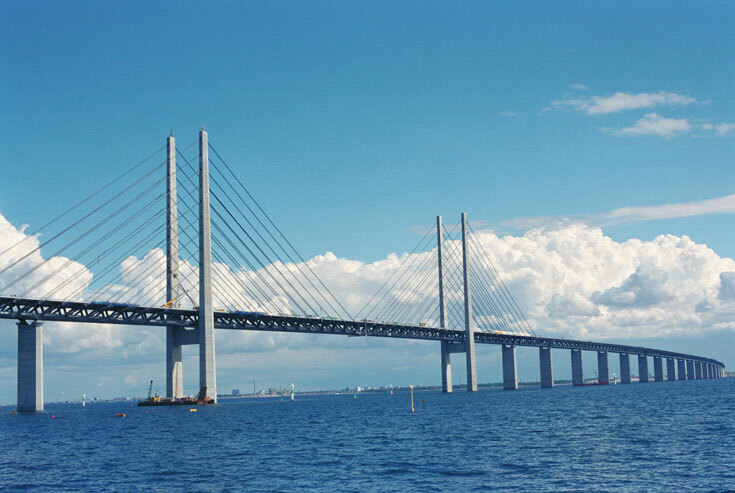 Funny thing that there’s a bridge linking Copenhagen to Sweden but the Danes didn’t bother to link Copenhagen with the rest of their country. I’m a newbe here, btw, and I’m really enjoying your blog! No, sorry, there is a bridge between Zealand (Sjælland) and the rest of Demark, it was just my asshatty SatNav that insisted on me taking ferries whenever possible. I’ve had words with it however, and it seems to behave now. They start harmless enough, you know, forcing you to take ferries (see also http://xkcd.com/461/ ) and suddenly they’re taking over the world or something like that. I hope you won’t need to write about the robot revolution any time soon.